Overnight Bag ($100): this duffle bag by Purse and Clutch is made in Cambodia by a women’s artisan collective. This company partners with artisans from around the world to create beautiful purses. I loved that when I received my bag it came with a description on how these textiles are made, giving me a much more personal connection to my bag and the artisan that made it. Also for every $200 spent an artisan is employed for one month. Black Lace Up Boots ($18): These black wedge booties were not sustainably made. But it’s a good point to make that buying USED clothes is another way to be more socially responsible. These shoes are from Goodwill, and its far better to buy used items than for these products to go in landfill. Also, by purchasing used items I am not increasing the amount of products made. Black modal/spandex dress ($88): Marine Layer is a great USA made company. Almost everything is made in California – the one exception is they recently partnered with a factory in Thailand where they sew more technical products, such as outerwear. My only critique is I don’t beleive their cotton is organic, yet their modal is made from 95% recycled beechwood. Their clothes are rediciously soft – my CA-made dress feels like pajamas but looks super chic. White and black pullover sweater ($60): Marine Layer has got me hooked. This is a reversible sweater – its black and white striped, but if you turn it inside out its black and white polka dot. So cool that its actually like buying two sweaters! The quality of their products is amazing. I love that I’m buying locally-made clothing. Plaid flannel long sleeve ($5): I included another item that falls under the sustainable category because I got it used from Goodwill. 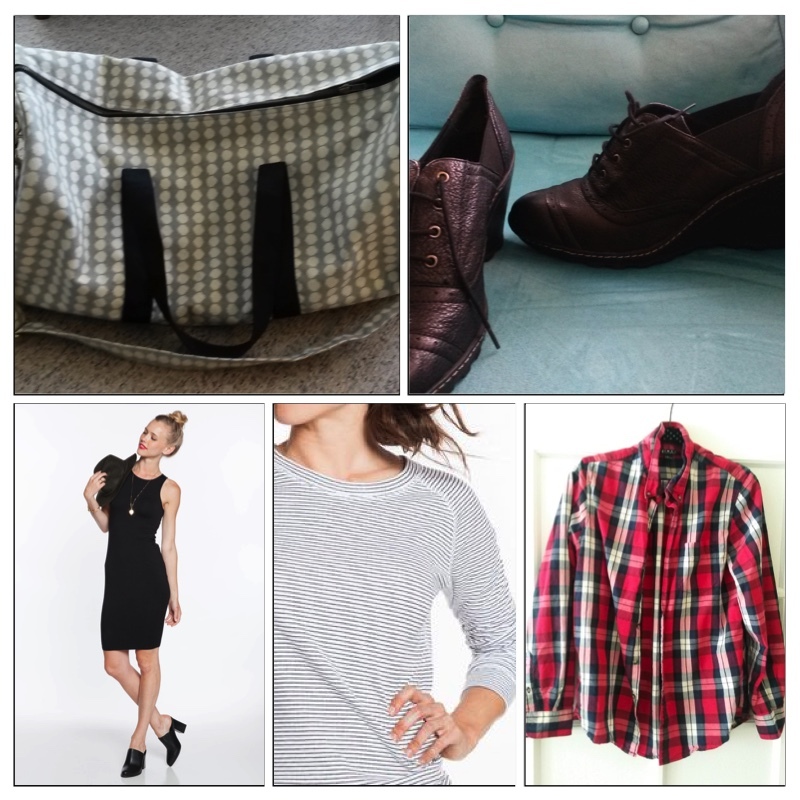 Plaid is the quintessential fall look! Grey pencil skirt ($38): This skirt is from Alternative Apparel and its so lightweight and timeless. It’s made from organic cotton, recycled plastic bottles and used non-toxic, low-impact dyes. This company really emphasizes the sustainability of their materials. They don’t specify where their factories are located, only that they work “on a global scale.” Factories they work with are in accordance with the Fair Labor Association Workplace Code of Conduct. While I applaud their use of sustainable materials I am not completely satisfied with the information regarding their factories and worker rights. I plan to do more research…. 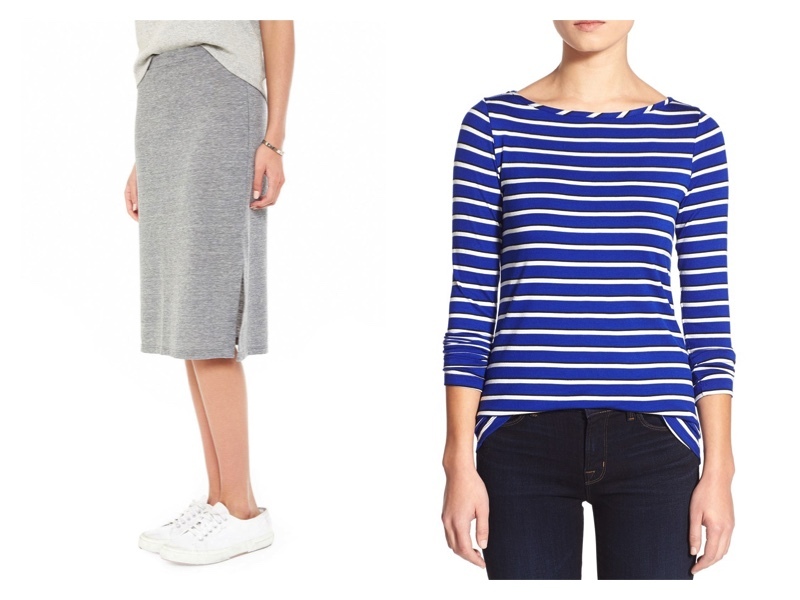 Blue and white striped long sleeve shirt ($35): This modal shirt is from Amour Vert. This company is the cream of the crop when it comes to ethical companies. Some of the other companies I found appeared to be using sustainable fabrics or were locally made, but not both. But this company delivers! (…at a higher price. This shirt was originally $90 before its sale price). The original price may be a little steep for many of us, but don’t give up on them because their sales are great. Also for every item you buy they plant a tree! Next > Causebox Subscription Box!